Apple picking is one of our favorite fall activities. The only trick to apple picking is using up all the apples when we come home because we tend to pick more than we need. We keep some for lunches and apple pie in a jar, and we always keep plenty on hand to make our favorite dessert, baked stuffed apples. This delicious treat is basically an inside out apple pie. It has all the goodness of pie – soft baked apples, brown sugar, a crispy topping – without the hassle of a crust. 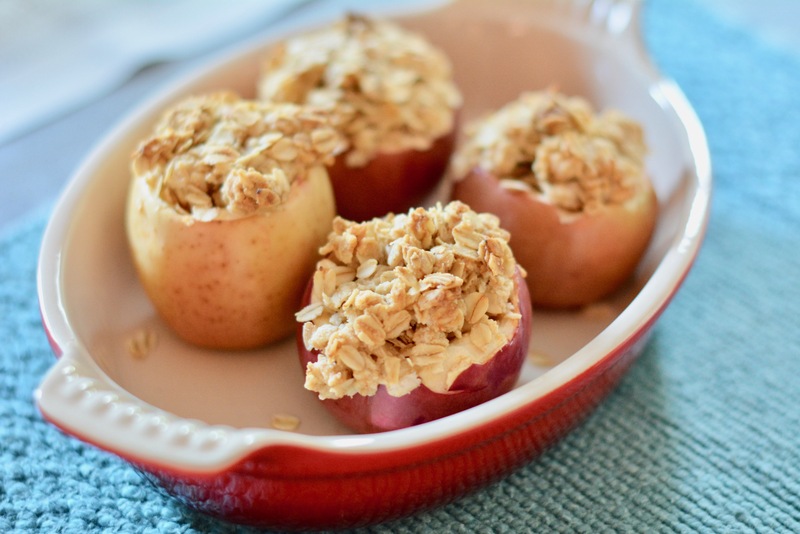 We make baked stuffed apples by carving out the apple, mixing the scooped out apples with some sugar and vanilla, then adding the mixture back in and topping it with a crunchy oatmeal crumble. Then they bake to soften and the lovely apple dessert is ready! Step 1: Preheat the oven to 375 degrees F. Line a 12x12 in baking dish with foil and set aside. Step 2: Slice the tops off of the apples. Remove the core from each one, being careful not the pierce through the bottom of each apple. Using a spoon, dig out the inside of each apple to the best of your ability. Place them in the lined baking dish. Cut the scooped out apple up into bite size chunks. Step 3: Add the chunks of apple to a bowl and toss with the sugar, cinnamon, cornstarch, lemon juice, vanilla extract, and sea salt. Fill each apple with equal amounts of the mixture. Step 4: Make the topping by adding all the topping ingredients to a bowl and pinching them together until crumbs form. 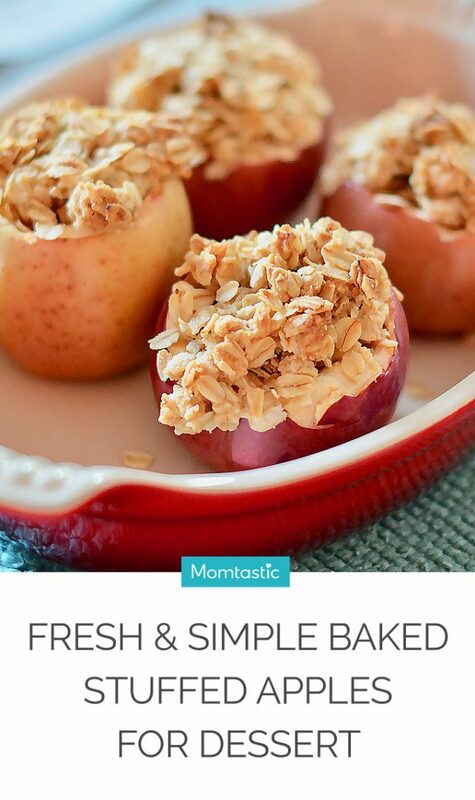 Press the topping into the top of each apple. 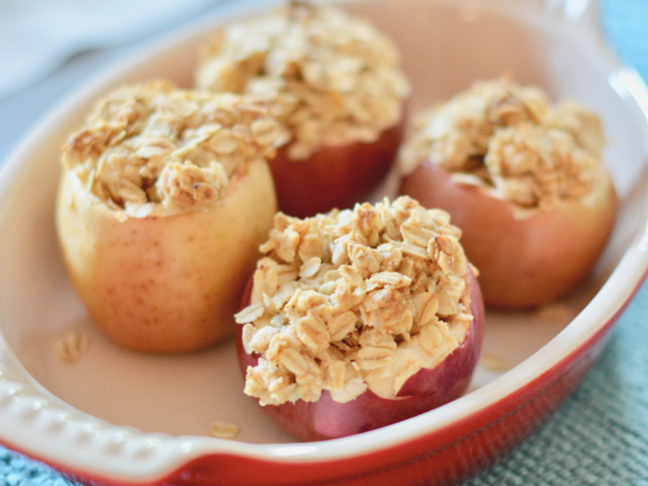 Step 5: Bake the apples for 35-40 minutes, or until the topping is browned and bubbly. Check the baking halfway through and tent the apples if they look too brown on top.